After yesterday’s long walk and wind down with Paddington, last night saw the majority of our children in bed asleep at a reasonably early hour. Which of course meant that they were up early this morning, much to Mrs. Booth’s delight. First challenge of the day was to pack bags. Correction, first challenge of the day was to decide which of the various piles of clothes strewn around the floor actually belonged to which bag. Then try to get it all into the bag and close the zip! And all before breakfast. Breakfast was another gargantuan affair, which gave us the carbo-load needed to haul our packed bags out of the rooms and down to the buses. After passing our room inspections, it was on with the day’s activities. One group went in search of Bruce, the hostel’s resident escape artist goat, in order to give him and his slightly calmer compatriot Wayne their morning feed. Bruce, of course, decided he didn’t want to wait and went in search of the children – to great delight. After eventually enticing him back to his pen, the children also went to see the pigs (“Is that a cow?”) before coming back indoors for Mrs. Seward’s bingo session – well done to Molly for getting a full house. 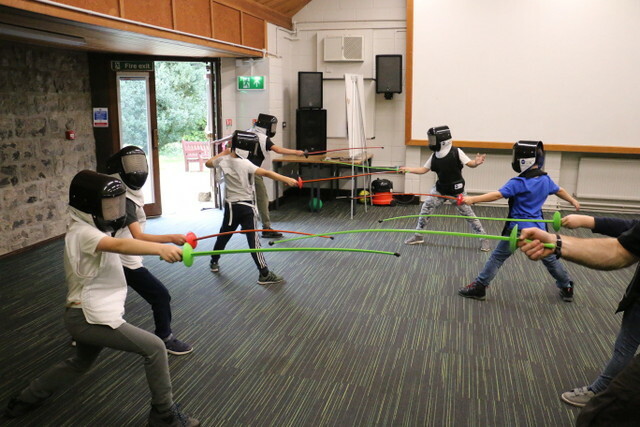 The other group, meanwhile, were learning to en garde, the lunge and some other basic footwork related to fencing, in a session with Tim. Padding up with our masks on, Dexter took great delight in stabbing Mr. Suter with his foil, although later on when the groups changed, Sebastian was slightly nervous when Mr. Suter was lunging at him. It was an exhausting session, but great fun and one which the group thoroughly enjoyed. After a well earned drink, it was time to make some fossils – unfortunately Mrs. Booth had not booked us in for long enough to wait 330 million years to make them naturally, and so we cheated a little with plaster of Paris and used a plasticine mould to make our own. And then to lunch, and the buses, and a sneaky ice cream on the way home, and you probably know the rest from there on in. We’ve had a wonderful three days, with lots of fun, learning and new experiences. The weather has behaved – it only rained on the last day once we had come indoors into the hostel for our final activities. The children were also a credit to themselves and the school. On our first morning at breakfast, picture the faces of the ten or so other independent guests at the hostel as our band of 17 children marched in – horror, mainly, as they expected their peace and quiet to be shattered but more than one of the other guests over the two days commented on how well behaved the group had been. The hostel themselves mentioned that we were their first school group of the year – they said they only wished all the following groups would be as good as ours.